UNITED NATIONS, Dec 7 2018 (IPS) - When the long-awaited UN conference focusing on the rights and safety of migrants and refugees takes off in Morocco, it will be a rare, if not an unprecedented meeting, for one reason: the withdrawal of at least seven member states almost at the 59th minute of the eleventh hour. As the international community struggles to resolve a spreading global humanitarian crisis, and restrict the intake of refugees and migrants, the approval of a “Global Compact on Safe, Orderly and Regular Migration” is turning out to be a politically sensitive issue. The United States, which withdrew from the long-drawn-out negotiations back in December last year, will be a notable absentee, along with Austria, Hungary, Poland, Israel, Switzerland and Australia—all of whom have problems relating either to refugees or migrants. Other non-starters may include Bulgaria, the Czech Republic and Slovakia, according to published reports. Not surprisingly, these countries don’t want to be a party to a compact, which is expected to be adopted at the meeting in Marrakesh December 10-14. This despite the fact that 192 member states, minus the US, finalized the Global Compact last July, after years of negotiations. The reluctance is all the more surprising because the implementation of the compact is voluntary – unlike the mandatory 1951 Refugee Convention which has been signed and ratified by virtually all of the 193 UN member states, but not necessarily implemented. As the Marrakesh conference is about to get off the ground, Denmark has announced plans to move “unwanted” immigrants to Lindholm Island, two miles out to sea, and once used for studying sick animals, according to Cable News Network (CNN). “Rising far-right and anti-immigration sentiments that have swept Europe have now reached the highest levels of government in Denmark. Some of the country’s legislators have made it clear they have no qualms about testing the boundaries of human rights conventions to preserve what they call the Danish way of life. The controversial deal still must be passed by the parliament”, CNN said. So, it seems very likely that Denmark may also join the rest of the team of absentees at the conference. However, about a dozen countries are not participating and some additional countries are having strong objections raised by opposition parties to signing the Global Migration Compact (GMC), he added. This will certainly have serious negative consequences on the Compact, especially as the United States — the largest immigrant receiving country — is having no part of the Global Compact. “It will also be problematic for the European Union (EU) as these countries are divided on the Compact and some are not participating in the conference,” he noted. In an interview with the Associated Press (AP), Louise Arbour, the UN Special Envoy on International Migration, said she was “very disappointed” that some countries are reneging on their support — and in some instances for “bizarre” reasons. Meanwhile, one in every 70 people around the world is caught up in a crisis, including the refugee crisis, with more than 130 million people expected to need humanitarian aid next year. The United Nations and its partners will aim to help more than 93 million of the most vulnerable people, according to the 2019 Global Humanitarian Overview presented by Emergency Relief Coordinator Mark Lowcock in Geneva last week. In a statement released December 5, the International Federation of Red Cross and Red Crescent Societies said migration has always been a polarizing topic. But in recent years it has become even more divisive, to the point of dominating elections in many countries. Concerns about the impacts of migration on receiving states have led some governments to adopt strategies specifically designed to reduce and deter migration, extending even so far as restricting access to essential and lifesaving services including basic health care, shelter, food and legal assistance. The IFRC said governments have the right to set migration policies. However, contrary to conventional wisdom, all migrants, even those with no claim to asylum, have rights under international law. These rights include access to health, safety and protection. Chamie told IPS that while the implementation of the Compact is voluntary, it is establishing global norms concerning international migration, which is a goal in itself. Countries are sovereign — something that has universal agreement– and they will promote their national interests even when it violates agreements they’ve signed, he added. Asked about Denmark’s plans, he said confining “unwanted” immigrants to a remote island as Denmark proposes is likely to be problematic in many respects. Aside from the important issue of human rights, it will be difficult logistically and will become increasingly problematic, especially with respect to children and those needing medical care. Moreover, over time as the numbers increase, the difficulties will be compounded, he added. Chamie also pointed out the simple fact : the supply of potential immigrants is FAR, FAR greater than the demand. In addition, the receiving countries are selecting immigrants and many of those who wish to migrate will not be selected. “As a result, many of those migrating without legal status are claiming asylum and seeking refugee status when in fact they are actually seeking employment opportunities and improved living conditions for themselves and families,” he added. And as a consequence, Chamie pointed out, people are migrating illegally and upon arrival at their desired destination will attempt to remain in the country by all means possible, including seeking refugee status. Again, one has to face the demographic facts, something most politicians typically avoid. Many of the populations of migrant sending countries are growing rapidly and most developed receiving countries are growing slowly. The considerable pressures and strong forces for illegal immigration will certainly continue and the receiving countries are still lacking effective policies to address this demographic phenomenon, declared Chamie. 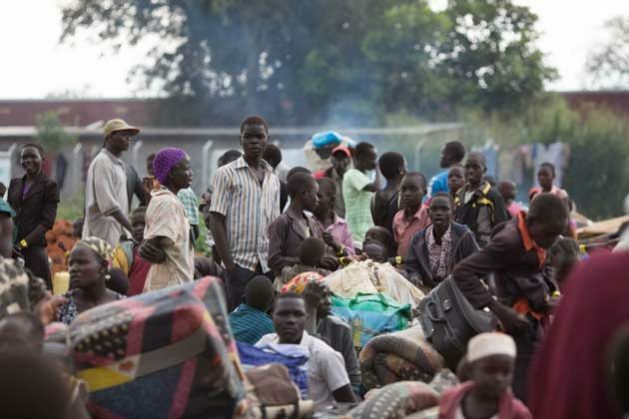 Sorry but a south Sudan has every right for safe migration in the continent of Africa as does a Somalian ..Poland will do its duty to take in Ukrainian refugees ( Europeans help Europeans.